Potatoes (Solanum tuberosum) are one of the easiest plants to grow in containers, as they can do well in limited space. Although gardeners can use buckets, bags or planters, containers made from old tires are a novel and inexpensive way to create an easy-to-care-for potato patch. Because tires can be stacked, they have more room than a conventional growing container, allowing gardeners to grow large and small potatoes. The higher the tire stack, the more potatoes it produces. To grow potatoes in tires, you want to be able to progressively stack the tires as this will ensure a more bountiful harvest. Start by cutting off the sidewall of the tire (the noncorrugated side that dips in where it attaches to the wheel). Use a sharp utility knife and wear work gloves for better grip and to protect your hands. Cut the sidewalls off of at least three and up to five tires. Tires do not need to be secured to the ground or each other as their weight, when filled with dirt, is significant. If you feel extra support is needed, however, place metal rods or bamboo poles 3 to 4 inches in the ground, pushing against the tires. Encircle the tires with at least three to four rods or poles to ensure the tires cannot shift. 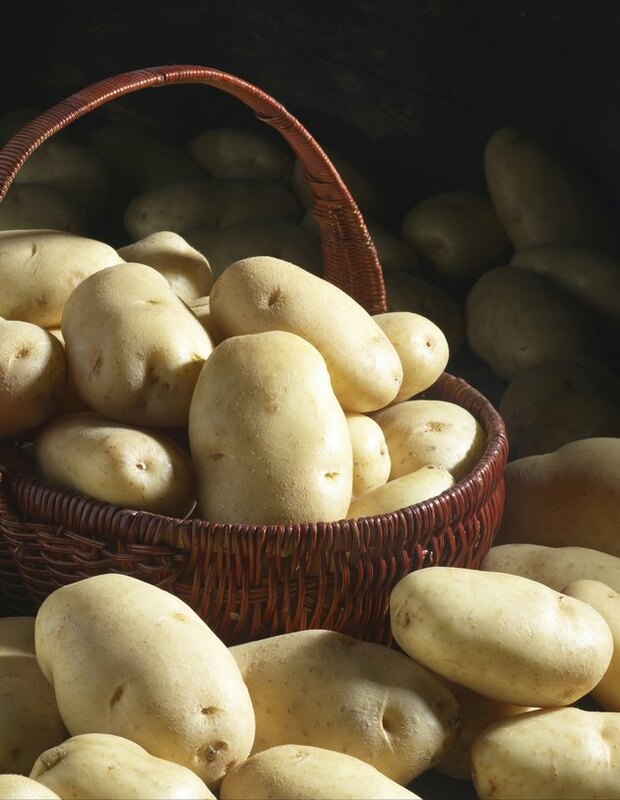 Potatoes grown in tires need well-draining, loose soil and full sun, as well as at least six hours of sunlight a day. They do best in soil that is acidic and sandy. Because they thrive in nutrient-rich soil, potatoes planted in tires can be grown entirely in compost, although potting soil can be mixed in. Because you will be adding fresh compost to the patch each time you add a tire, there is no need to fertilize potatoes. Thanks to stacking, both larger-sized potatoes, such as maincrop potatoes, as well as smaller, early crop, potatoes can successfully grow in tires. For a distinctive potato, try the "Purple Majesty" (Solanum tuberosum "Purple Majesty"), which produces a potato with purple flesh and skin. The "Russet Norkotah" (Solanum tuberosum "Russet Norkotah") is a more classic choice and produces potatoes good for baking. Potato plants produce violet flowers and low clumps of green leaves that reach 1 1/2 to 3 feet in diameter and height. To plant potatoes, fill one cut tire with loose compost until only 1/2 inch of space exists at the top of the tire. Cut several seed potatoes so each piece contains at least two eyes. If you want, chit potatoes beforehand, letting the seed potatoes sit out until 1-inch sprouts appear on each piece. It will take roughly six weeks for the sprouts to grow large enough. If you are cutting potatoes, let the pieces dry out for one or two days before planting. Place three to four seed potatoes in a circle around the center of the tire, pushing them halfway down into the dirt. Place the shoots or eyes of the potato facing up, and cover the seed potatoes with compost. Water the potatoes regularly, giving them 1 to 2 inches of water per week. It is better to water deeply and infrequently, soaking the soil 8 to 12 inches deep each time, than to water lightly and frequently. The soil should always be moist to the touch. Water at the base of the plant to reduce the amount of moisture left on foliage as this increases the risk of disease. Once the potato plants have grown about 8 inches high, stack a second tire on top of the first, filling it with compost. Keep the plants upright, so only 1 to 2 inches of the plant shows through. Continue doing this until you have stacked at least three tires (up to five is possible), hilling the plants each time so they are covered with fresh compost. When the tops begin to dry up, the potatoes are ready for harvest. Do so by gradually removing tires, harvesting as you go. It should be 10 to 20 weeks after the last tire is stacked and planted with potatoes. Maincrop potatoes take longer to mature, while first earlies mature quickly.